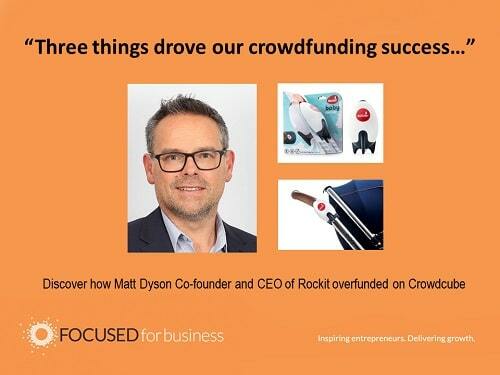 Matt Dyson Co-founder and CEO of Rockit knows what successful crowdfunding takes. He and his team beat their crowdfunding target and overfunded to raise £253,000 in May 2018. It’s been quite a ride. Rockit only launched in October 2017 and to beat their investment target within eight months of trading is testament to the efforts of the team. Hatty Fawcett of Crowdfunding Accelerator asked Matt what he thinks made the difference to Rockit’s successful crowdfunding campaign. Hatty: What attracted you to crowdfunding for your investment raise? Matt: Ever since we launched Rockit, the portable baby rocker, in October 2017, its been creating a real buzz. As we started thinking about raising investment, we had already built up quite a following amongst parents both in the UK and abroad. Crowdfunding seemed a perfect match as we could access a large pool of potential investors whilst simultaneously building a group of Rockit brand advocates. It was a fantastic opportunity to increase our exposure at the same time as raising the investment. Hatty: Many early-stage businesses with a strong product start with reward-based crowdfunding, why did you choose to do equity crowdfunding? Matt: We had already launched Rockit and it was gaining traction in the market. The team were working on a range of follow-up products to solve various child sleep issues. We chose to focus on equity crowdfunding to raise capital to bring these new products to market as quickly as possible, but also to increase marketing spend both in the UK and overseas. Our investors will benefit from the success of the business as a whole, not just a single product. Hatty: What do you attribute your successful crowdfunding campaign to? Matt: The appeal of our product has to be a factor. Rockit itself certainly caught the eye of investors as there is nothing quite like it on the market. Thorough preparation for the campaign was another key attribute. Hatty: A lot of crowdfunding platforms won’t accept you on to their platform until you have secured some of your investment target. Did you have a “lead investor”? Matt: I agree that securing some of your investment prior to putting your campaign live is important for successful crowdfunding. We managed to reach 40% of our funding target prior to going live on Crowdcube so we had primed the pump but we didn’t have a single lead investor. Instead we were backed by a number of smaller investors who had followed our progress over the previous months. This, coupled with the fact that we still had some SEIS allowance for the early investors, meant that the campaign got off to a flying start. Hatty: What promotional activities did you undertake to bring “the crowd” – those you didn’t know prior to crowdfunding – to your pitch? Matt: We promoted the raise on all our social media platforms, posting regular updates about the campaign but also about key successes within the business generally. Whilst we were live we signed several distribution deals including one in the US. We also won several design and consumer awards. These successes were very timely and we certainly found it encouraged investment during the campaign. We were also lucky to be featured on ITV’s ‘This Morning’ and that generated additional press interest. This PR drive was probably the most effective way of engaging with the crowd as it snowballed organically and drove lots of potential investors to our campaign page. Hatty: What advice, tips or successful tactics would you offer to anyone preparing for crowdfunding? Matt: This gives you time to identify all the potential investors in your various networks and start conversations with them. Another tip is to get feedback on all your campaign materials – video, deck and pitch page before finalising them. This is something we did repeatedly with both the Crowdcube team but also via feedback from experienced investors within our personal networks. Hatty: Many founders who successfully crowdfund tell me it is very time-consuming. What do you recommend for maintaining your motivation and commitment when crowdfunding? Matt: It’s certainly challenging running a crowdfunding campaign whilst also maintaining the day to day running of the business! Our days were long and we often found ourselves emailing responses to potential investors late into the night. Hatty: Have there been any surprising outcomes from your successful crowdfunding? Matt: Yes! Crowdfunding has certainly raised the profile of our business, not just in the UK but overseas too. We are following up some leads from potential international distributors who became aware of Rockit through the Crowdcube campaign. We have also had some investors offer expertise and advice on a voluntary basis as we move forward. All in all it’s been a very rewarding experience. 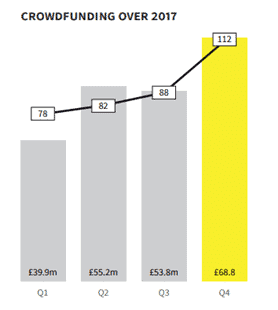 Back in 2016 there was a slight dip in the number of crowdfunding deals causing speculation as to whether crowdfunding was plateauing as a route to investment. However, according to recent research from Beauhurst, the sector has “bounced back” in 2017 – particularly in the final quarter of 2017. Crowdfunding is moving its focus onto larger deals and the number of crowdfunding deals under £499,000 is beginning to decline. This is in contract to angel investment which remains relatively stable at both a higher and lower level. As the equity crowdfunding market matures distinctions are becoming clearer in terms of approach. Crowdcube and Seedrs are working to a volume model and encourage a broad mix of investors. Syndicate Room and Venture Founders, on the other hand, seem focused on doing few deals but with a higher average amount invested. Both Syndicate Room and Venture Founders attract a particular type of investor – mainly High Net Worth (HNW)or sophisticated investor who, arguably, have the ability to invest more. This month (March 2018), OurCrowd, a global equity crowdfunding platform have announced they are opening an office in the UK. Their approach is similar to that of Syndicate Room and Venture Founders and focuses on attracting HNW and sophisticated investors. What are the implications for startups, business owners and founders? Crowdfunding remains a strong route to funding but it does take hard work and a lot of preparation behind the scenes to run a successful crowdfunding campaign. As the crowdfunding platforms focus their efforts on larger deals, businesses looking to raise relatively small amounts of seed investment (less than £250,000) may find they receive less help and support on a one-to-one basis from their chosen crowdfunding platform. Businesses are advised to look to alternative, independent programmes and advisors to gain this support instead. There are a number of such programmes. Good ones include Crowdfunding Accelerator, TribeFirst and IdeaSquares. Angel investment remains an important plank in any seed investment round – for two reasons. 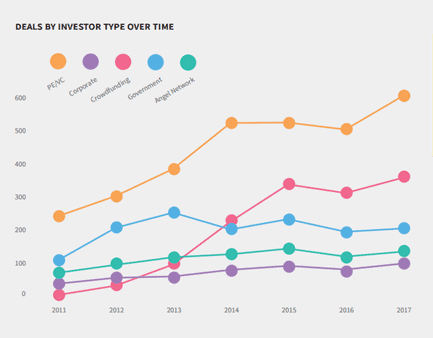 Angels are still actively investing in smaller rounds, as the Beauhurst data shows, but also a lead angel investor can provide access to crowdfunding platforms like Syndicate Room who won’t accept any business unless they have secured a lead investor. This free 60 minute, live and interactive webinar reveals everything you need to know to succeed at crowdfunding from how to choose the right platform, what to put in your crowdfunding pitch and the thing that no one tells you but which really makes the difference between success and failure. In January HMRC announced changes to the Seed Enterprise Investment Scheme (SEIS) and the Enterprise Investment Scheme (EIS) and will no longer provide advanced assurance that a company qualifies for either scheme on a speculative basis. It is now necessary for any company applying for advance assurance to name at least one investor or fund manager who wants to make an investment. This has created a chicken and egg situation. SEIS funds, crowdfunding platforms and business angels like to know whether a company has advanced assurance from either or both of these government-backed schemes before they will commit to an investment and yet founders and business owners are unable to seek advanced assurance unless they have an interested investor. There is no doubt that having advance assurance for SEIS or EIS is an important stepping stone in the process of attracting investment, so what is a founder or business owner supposed to do? Having spoken to a number of funds and crowdfunding platforms, it seems the advice for now is to provide a named individual when you apply for advance assurance but – as there is no requirement for that specific individual to complete their investment – you can provide the name of anyone considering investment provided you have their permission. They do not actually have to complete the investment – but they pave the way for others to do so. 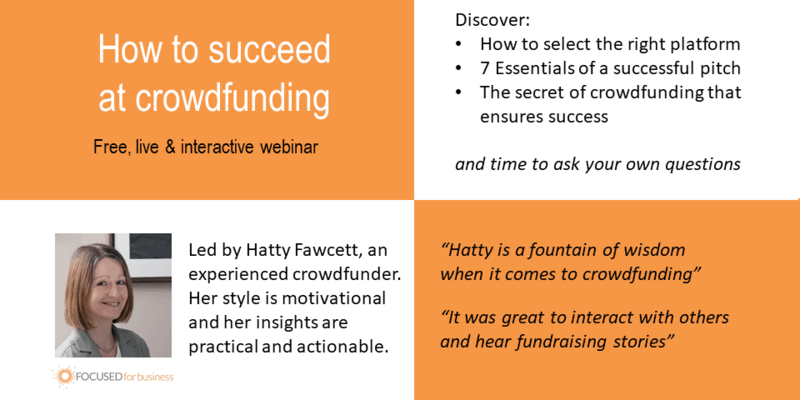 A free 60 minute, live and interactive webinar presented by experienced crowdfunder Hatty Fawcett, Founder of Focused For Business. How to select your crowdfunding platform to attract the right investors. The 7 essential elements of a successful investment pitch. The secret of crowdfunding (that no one tells you) which is key to success. How to set your crowdfunding target to ensure success – not failure. The inside track on how to off-set risk to attract serious investors. Places are limited to ensure a good interactive experience. Please book early to avoid disappointment – scroll down to book. As the webinar is online, there is no travel time, simply log from your computer wherever you are – all you need is an internet connection and a webcam. A login link will be emailed prior to the webinar. There is no need to bring anything but please come ready to participate fully. Hatty will share specially prepared content, answer your questions about crowdfunding and give you the opportunity to learn more about the eight week online programme, Crowdfunding Accelerator. (If your browser does not display the booking form, click here to be re-directed to an Eventbrite booking form). Hatty Fawcett raised £250,000 through crowdfunding and angel investment for her own business venture. She learnt the hard way what it takes to raise investment and now speeds up the process of getting investment for startups and early-stage businesses. Hatty runs Crowdfunding Accelerator an eight week programme designed to make it quicker and easier for businesses to prepare for crowdfunding. She regularly speaks on crowdfunding and is an active blogger on the subject of raising investment. Hatty is also a Regional Manager for Angels Den and is a Talent Spotter for The Start-up Funding Club. Kellie Forbes and Gill Hayward, Co-Founders of YUU World, know what it takes to raise investment. They survived “Dragon’s Den” (TV programme) receiving offers from all five dragons and going on to raise investment from Peter Jones and Deborah Meadon. Then, in 2016, they raised £210,000 from a number of business angels. In 2017, with the business doing well and a new product to launch, Kellie and Gill turned to crowdfunding to raise investment to launch the new product but, more importantly, to test demand for their latest creation, YUUGo a GPS tracker backpack which provides parents with everything they need to keep their kids both entertained & safe on-the-go. Their crowdfunding campaign didn’t raise what they hoped but they still feel the campaign was a success and that crowdfunding was very worthwhile. Hatty Fawcett of Crowdfunding Accelerator caught up with Kellie to find out why and to discover what they’d learnt in the process. Hatty: What attracted you to crowdfunding for this investment raise? Kellie: We were attracted to crowdfunding to launch our new product not just because of the financial support, but because we thought it would be a great way to test the desirability of our newest product. We also wanted to gain some valuable insight on how to improve our product along the way. Hatty: What influenced your decision to do reward-based crowdfunding (rather than equity)? Kellie: YUUGo is a tech product (it uses GPS/Wi-fi tracker to allow children to track their journeys whilst giving parents the ability to see where their kids are). We noticed that “wearable tech” performs particular well on reward-based crowdfunding platforms. It seemed a good way to reach out to new customers beyond those who already love our core product. Nothing is certain in crowdfunding – and we had some concerns – but we wanted to give it a try. Hatty: How did you decide at what level to set your crowdfunding target? Kellie: I would urge anyone considering crowdfunding to think very carefully about their crowdfunding target (the amount of money you want to raise). We reviewed a lot of crowdfunding projects before launching our own and, in many cases we saw the percentage reached outshining the actual target. When this happens “the crowd” tends to be encouraged by the initial response and join in backing the project causing an over-funding situation. This is very exciting when it happens but it can also be misleading. You have to deliver your promised rewards the minute you hit your (minimum) target, even if you are planning to go on and over fund. We considered setting a lower target (so that we were seen to achieve our target quickly) but we were concerned that if we set our minimum target too low we would not raise sufficient funds to meet our minimum order quantity with our factory, leaving us needing to deliver rewards without the minimum order quantity economies of scale. That would have cost us money! I guess what I’m saying is that setting your crowdfunding target is more complex than you might think. You’ve got to think about what you need, the costs of delivering your promised rewards and recognise that there is human psychology at play too. Hatty: Had you lined up some initial investors to support your crowdfunding pitch when it went live? Kellie: I cannot stress enough how important it is to do some in-depth prep and ground work on lining up initial investor pledges. I’d recommend lining up initial pledges that account for 40%-50% of your target – and you need these pledged in the first few days of your campaign to get the traction your campaign will need to reach “the crowd” (people you don’t know). We’ve found there is a difference between American and UK consumer behaviour on crowdfunding sites. We found that our campaign received good numbers of visitors but the conversion from our Facebook advertising and our database was not what we had anticipated. People can be scared off, or simply be confused about what they are there for, if they have not made a crowdfunding pledge before. I’d recommend providing a clear, short explanation on your pitch page explaining how crowdfunding works. UK consumers, in particular, seem less familiar with crowdfunding compared to, say, the USA. Lastly, and I feel this sincerely, I wish we had worked with somebody independent to our campaign and company so that we had another perspective and view on how to approach our campaign. In my experience, you cannot cover enough angles when preparing for your campaign! Hatty: Have there been any surprising outcomes from your crowdfunding campaign? Kellie: Yes! it was disappointing that we didn’t hit our target but we have learnt so much and had such useful feedback we feel the campaign has delivered – just not in the way we expected. We now know that we were not focused enough on finding that first 30% (of our target). It was dependent on us to get those pledges in and, whilst we believed we had these teed up, it took more than we anticipated to bring them home. The first two days of the campaign were exhausting, asking friends and family to pledge. If we had understood the importance of this better, we’d have prepared more pledges before going live. That said, we’ve had amazing feedback regarding the new product. That’s been insightful. We know we have a desired product, but we now realise there is another way to deliver this – as an add-on option rather than a bespoke product. We had considered this before but had opted to make a stand alone product. It was feedback by via the crowdfunding campaign that has caused us to re-think this decision. We have a better product as a result. Another unexpected outcome has been the amount of exposure our business has received and the impact this has on sales. We’ve had some lovely PR which has been brilliant (including a spot on BBC Business Breakfast). Better still, we’ve seen this exposure directly impact on sales. Our sales are up almost 20% which is thanks to the crowdfunding campaign exposure. Experience tells us that this will also bode well for the all-important Christmas sales period too. The Financial Conduct Authority (FCA) which regulates both peer-to-peer lenders and equity crowdfunding platforms has announced that it plans to introduce more regulation to protect potential investors and help them understand the risks of investing via crowdfunding. These changes could lead to new eligibility requirements for companies wishing to crowdfund and greater scrutiny of their businesses plans and forecasts, making it harder for businesses to be accepted onto equity crowdfunding platforms. It is also possible that crowdfunding pitches will require greater validation in order that risks can be more accurately assessed and reported. Schumacher College in Dartington, South Devon seeks to inspire, challenge and question people as co-inhabitants of the world. They are an international centre for nature-based education, personal transformation and collective action. They offer a range of residential courses on ecological themes and transformative courses for sustainable living. A number of co-creators from the college developed the Deep Time Walk App which provides a walking audio history of the living Earth, giving people a detailed and dramatised experience of the planet’s 4.6 billion year history. During this educational walk, people walk a distance of 4.6 kilometres whilst listening to the Earth’s story (via the app) and are encouraged to connect their own short-lived experience of time on Earth with the vast expanse of geological time. The college needed funds to complete development of the app and with revenue generated from the sale of the app hopes to raise sufficient investment to fund a number of bursaries for the college. On World Earth Day in April 2016 they set out to raise £21,000 on reward-based crowdfunding site, Crowdfunder.co.uk. 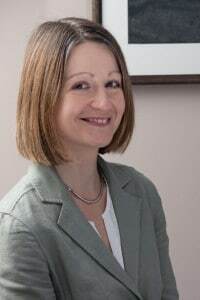 Hatty Fawcett, experienced crowdfunder and Founder of Focused For Business and Crowdfunding Accelerator, asked Robert Woodford to share what he learnt from this crowdfunding campaign and to offer advice to others thinking about doing crowdfunding. Hatty: What attracted you to crowdfunding? Robert: Schumacher College has a strong alumni who share our ethos and vision for the world. Many of our alumni had undertaken the physical Deep Time Walk at the College (from which this project arose) and so had a strong affinity for the project. It was natural for us to want to talk to this pre-existing “crowd” (via a mailing list of 17,000 people) and share our vision. Crowdfunding enabled us to turn a shared vision into a tangible financial commitment of support for our project. Hatty: How did you approach your crowdfunding campaign? Robert: We did a wide review of best practices associated with crowdfunding and spoke to a number of people that had already managed a campaign, including yourself Hatty – your advice helped us think about the common pitfalls involved in the process of crowdfunding. The team at Crowdfunder were also a great help in providing support and advice both before and during the campaign. It proved crucial to have this information and advice upfront because, once live, the campaign moved very fast and we would have missed out if we hadn’t had all the elements of the campaign lined up well in advance. I have to say, it was tough work and enduring attention to detail was needed in the weeks up to launch and then constantly throughout the campaign. Gruelling but rewarding! Hatty: How long did it take to prepare your crowdfunding campaign? Robert: We starting thinking about our campaign six months before we went live, and then planning started in earnest three months before. Crowdfunding takes longer than you might think. We’d expected to launch about a month before we actually did. It was the right decision to delay the launch as it meant we had everything lined up and, importantly, we secured upfront financial commitments which ensured the campaign was a success. Hatty: How much of your campaign target had you had promised by the time you put your crowdfunding campaign live? Robert: We had about 20% ready to be pledged before we went live. The biggest challenge was getting the timing of these pre-pledges lined up with the actual day our crowdfunding campaign went live, and then timing the push out to the wider support base after this. Robert: Planning is essential – I can’t stress that enough– as is keeping the momentum going throughout the campaign. One thing that worked really well for us was having incentives that were, effectively, limited edition. The rewards were also of high value to our target base for support. We made exclusive audio recordings with Satish Kumar, Martin Shaw and Stephan Harding, and provided an set of lectures which totalled over 4 hours. We also have put in the effort to produce an exclusive book and audio cd, which was attractive to potential supporters. And, we would only release a certain number for each reward category and when these were taken, that was it, they were gone. This encouraged people that visited our crowdfunding campaign to pledge, there an then, whilst they were on the site. If they’d waited the reward might have run out. 1) We kept the number of each reward low so that people were encouraged to pledge before a reward ran out. 2) We offered an incentive that the first 50 people that pledged would receive access to an early version of the product, which really helped bring in the early pledges. 3) Half way through the campaign, we launched a match-fund campaign, which brought in a substantial mid-boost to our crowdfunding campaign. It worked so well it enabled us to add stretch targets which provided further momentum to the project. Hatty: How did the match-fund incentive work? Robert: Essentially, I got three donors in place who each promised to contribute a relatively large sum if we raised matching funding through the crowdfunding site. It was difficult getting the first major donor but, once we had one on board, it was easier to encourage others. The first donor offered a commitment of £1,000 if we could match it through the crowdfunding site. I then got a commitment of a further £3,000 from another two donors. This created a theoretical match-fund pot of £4,000. All we had to do was raise the same amount of money through our “crowd” and that would trigger the match-fund investment. Our wonderful “crowd” came up with the goods on the same day we told them of the initiative! So, what started as a £1,000 commitment became an £8,000 investment. In fact, we actually went over the target amount before the match-fund was pledged and so we pushed on to reach towards our stretch target. Originally we’d hoped to raise £21,000 but we actually raised over £26,000. Match-funding really incentivised our crowd and our match-funders were excited by it too. They felt they were doing something special which boosted support generally. Hatty: Would you do crowdfunding again? Robert: Yes, it’s an exhilarating if sometimes stressful ride, and it was wonderful to be part of a project that not only delivered the investment, but also has the potential to change people’s perspective on their place in the cosmos and how Earth formed over 4.6bn years. Perhaps even more importantly, we’ve created a growing community around this project. And that’s more compelling than the app on its own. We’re no longer a team of eight, but a community of 267 with a common passion and commitment to the project and it’s potential to give anyone, anywhere on the planet a perspective of deep time and where they came from”. If we nurture this relationship there are lots of opportunities down the line to do other things. Now, that’s exciting! Movem, the online community marketplace for landlords, agencies and tenants to list and review rental properties, raised £200,000 on crowdfunding site Crowdcube in just ten days (in August 2016). The investment allows Movem to expand into the residential lettings market, growing the business significantly. Hatty Fawcett, experienced crowdfunder and Founder of Focused For Business and Crowdfunding Accelerator, asked Peter to reflect on the process of crowdfunding and share his learnings. Hatty: What appealed to you about crowdfunding? Peter: I loved the idea of having 100+ brand advocates who are emotionally and financially invested in our product. Hatty: Did you consider any other forms of investment? Peter: We considered raising funds privately, including business angel investment. However, I felt Movem needed to make a mark on the industry – which is exactly what crowdfunding helped us to do. Hatty: How easy did you find the process of preparing for crowdfunding? Peter: Developing a crowdfunding campaign took a lot of time. It probably took me 2 months from making the decision to do crowdfunding to going live. The hardest thing for me was the video pitch. I knew it had to be good, but I didn’t know anybody that could help me make one. So I did it myself. I rented camera gear, got a tripod and filmed/edited the whole thing on my own. I wasn’t actually that happy with the final cut, but I couldn’t get any more footage, so I had to put up with what I had. On the positive side, that did stop me re-filming again and again. The guys at Crowdcube were very supportive too. Hatty: If someone is considering crowdfunding, what advice would you offer them? Peter: My biggest piece of advice is you need to recognise that crowdfunding isn’t easy. There’s a lot of work and effort that goes on behind the scenes. For example, I’d raised some of our investment target prior to putting our crowdfunding campaign live. That was hard work and took time, but it was really important in creating momentum for our crowdfunding campaign when it did go live. That’s the key really, demonstrating momentum. Peter: Even once you’ve gone live you have to keep that momentum going. You have to keep talking to everyone you think might be an investor. I’d wake up at 7am every day and spend the whole day contacting as many people as I could. Literally until I went to bed! I used everything available to me. LinkedIn, email contacts, the press, friends of friends, Facebook adverts…you name it. I tried it. Crowdfunding is a numbers game – and that requires persistence and hard work. Hatty: What percentage of your crowdfunding target had you raised before you put your crowdfunding campaign live? Peter: I had raised £85,000 so just over 40% of our target. Hatty: Is there anything you would do differently, knowing what you know about crowdfunding now? Peter: I’d probably be a bit more ambitious. I spoke to so many people during the course of our crowdfunding campaign, there was a ground swell of support and momentum. So many people got in touch afterwards that we could have easily funded £500k. What’s in a good investment pitch? When raising investment for your small business, you have to be ready to pitch at any moment. Anyone you meet could be an investor. It could be the person standing next to you on the bus, someone you meet at a networking event or party or even someone you play sport with in your spare time. Depending on the circumstances you may not have long to pitch. In some cases you might only have a minute to get your business across (the classic “elevator pitch” scenario), whilst in a more formal pitch environment (such as at an angel network pitch evening) you might have 15 or 20 minutes. Certainly, you won’t always have a Powerpoint presentation. You have to be ready for any eventuality. 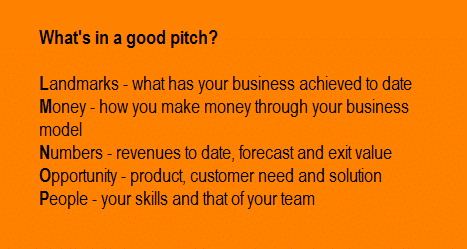 So what should be in your business pitch? A good place to start is with the business concept. What is it your business does? What problem are you solving for your customers? Even in a 20 minute pitch you don’t have long (and there are other things you need to talk about in addition to your products and services) so keep your explanation short and to the point. Focus on the key points and what makes your product/service different. If you are talking about your product/service for more than 25% of the length of your pitch than you are probably going into too much detail. Next up, talk about sales. What’s your business model and how do you generate revenue? Investors love to hear that you have more than one revenue stream and that you have experimented with different routes to market and identified the most successful channels. Ideally you are looking to show that you’ve hit upon a selling formula that delivers predictable results and is ready to be scaled up. Businesses don’t make themselves. It is people who make businesses successful. You must introduce yourself and your team in your pitch. You’ll want to talk about the team’s background, skills and experience. Leave the investor in no doubt that you have the right mix of people to drive this business forward. Your team should start to build your credibility in the eyes of an investor but you want to cement this by talking about your business achievements to date. Highlight any key milestones you have achieved: Key strategic partnerships you have formed, contracts you have won and revenues in the bank. Your pitch needs to demonstrate that you are already delivering results, even without the investment. No pitch is complete without some numbers. If you are already revenue generating share what monies you have banked. Forecast future revenues (realistically – no one will believe “pie in the sky” numbers) and be clear about your margin and breakeven. Be specific about how the money you raise will be used, and provide revenue and profit predictions for the point at which you plan to exit the business. You must have an exit plan. Investors will want their money back at some point. Without an exit they don’t get a return! Finally, be clear about how much equity you are selling in return for the investment. An unrealistic valuation can ruin an otherwise brilliant pitch. For advice on valuing your business, download my e-book. Oh, and one final thing, be sure to pitch with passion! 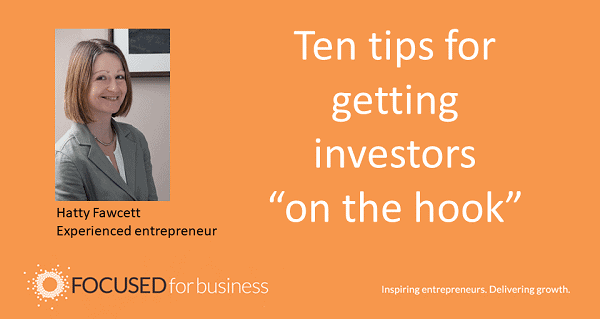 If you’re not excited by your business why should an investor get excited? Pitch with energy and enthusiasm and remember to smile and make eye contact. If you would like help in developing your investment pitch, contact me , Hatty Fawcett, to book a phone call.